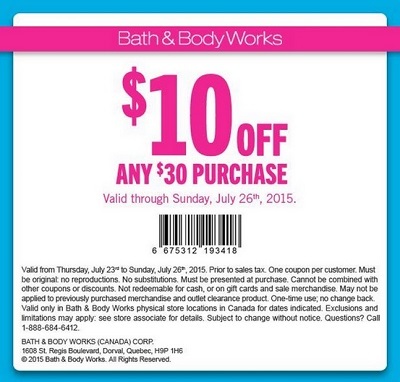 Weekend is so close, so enjoy it with printable coupon at Canadian Bath & Body Works stores. It's possible to take $10 off any purchase of $30 or more. Valid through Sunday, July 26th. Official source of the information is Bath & Body Works. More information about the promotion at Canadian Bath & Body Works store.